If you’re looking for a thick, road-map back, strong, sculpted legs and an all-over better physique, chances are you’ve come across deadlifts. Arguably, the best exercise you can do for both strength and size, the deadlift works most of the muscle groups in your body and drives you closer to your desired physique. Aside from the obvious physical advantages, deadlifts benefit testosterone release. And this article will teach you the essentials for getting the most out of the ‘King of All Lifts’. The deadlift is a classic compound multi-jointed exercise that utilizes the largest muscle groups in your body. In terms of boosting testosterone, the deadlift recruits more muscle mass through its complex movement, this places an increased metabolic stress on your body. The end result is massive boost in your testosterone levels (1). You need to train with some real volume when performing your deadlifts for the most benefit. In other words the more reps the better – with the sweet spot for deadlifts being around 5 reps a set. A bench mark for each session should be a maximum of 25 lifts spread across 5 sets. Aim for 5 barbell deadlifts spread over 5 sets per training session. The 5×5 method is tried and true for increased strength, size and testosterone. Aside from volume, a higher intensity also works wonders for your testosterone levels. The key is explosiveness, start strong and finish strong. Keep your eye on the amount of sets that you are performing and your work intensity, these two factors have a very close relationship. Missing out on either can slow your progress. Your rest intervals should be as short as possible (less than one minute); if you are looking to improve your gains. Find a happy balance with a higher intensity, shorter rest intervals between sets so that your lifting power is not reduced throughout your sets. For the best testosterone release benefits you want to be lifting at above 80% of your 1 rep max. Lifting heavy is not a new phenomenon for boosting testosterone. Research from the 1980’s reported that heavy lifting with a low rep range boosts all of your anabolic hormones when compared to lighter lifting with a higher rep range . However, never lift heavy on your barbell deadlifts until you have mastered the correct technique. Always keep your ‘form’ tight throughout the whole movement. Not doing so could lead to injuries, for both your joints, and your muscles. Find the right weight to lift, you should aim to lift heavy (>80% 1RM) after you have mastered the correct technique. This is key to working all the muscles evenly, increasing your hormonal levels and bringing out that killer physique. Lower the barbell to the floor by bending at the hips and moving the barbell backwards to the floor. Never hyper-extend your back as this can lead to hernia and lower back problems (especially if you are lifting heavy). Deadlifting is a compound move that boosts your testosterone levels. It is a full body exercise that uses multiple muscle groups which makes it great for strength and overall size. However, to get the most benefit you need to train smart. 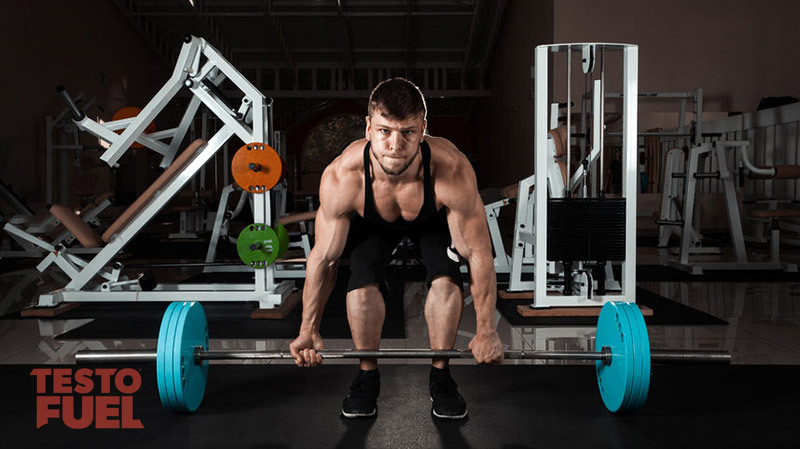 Using the right volume, intensity and weight you can take your deadlifts one step further and experience notable improvements in your testosterone levels and overall training. Especially if you’re using the 5 reps – 5 sets method. Want to gain even more testosterone? Boosting testosterone isn’t just about what comes out of your training, but also what goes in – and supplementing right is a good place to start, and there is no better option than TestoFuel. TestoFuel is an all natural anabolic support complex that provides your body with the nutrients it needs to increase testosterone and overall muscle growth. WD M, FI K, VL K. Exercise Physiology: Energy, Nutrition, and Human Performance. 7th ed. Baltimore, MD: Lippincott Williams & Wilkins; 2007. Craig BW, Brown R, Everhart J. Effects of progressive resistance training on growth hormone and testosterone levels in young and elderly subjects. Mech Ageing Dev. 1989;49(2):159–169. doi: 10.1016/0047-6374(89)90099-7.